With the stress of classes, clubs, a job, and all the other commitments students have, laundry can often get swept under the rug. 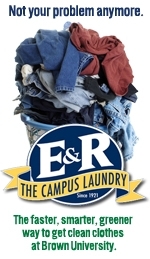 Don’t fret, let BSA and our laundry partner, E&R Cleaners, take care of it for you! Customers can drop off dirty laundry in a bag at Campus Center 035 or New Dorm. Laundry is returned professionally cleaned within just a few days! To get started, simply click the "Order Now" button and type in the school-password: AM13. To place your order by phone or for any customer service questions, please call 1-800-243-7789. Customers can drop off and pick up their laundry bag at the BSA Laundry Room in Campus Center 035. Customers can swipe in with their Brown ID. If you are a customer and cannot access the room, please email bsa@brown.edu with your Brown ID. The location is monitored 24/7 by a security camera, and the card swipe records all entries made.